Due to the dieback caused by invasive fungus Hymenoscyphus pseudoalbidus, ash is threatened in many regions of Europe. In order to predict the situation with ash ecosystems, it is important to examine forest regeneration in areas formerly dominated by ash with long disease history and known management. The main aim of the present study was, therefore, to evaluate forest self-regeneration following clear-felling of ash dieback-devastated stands, focusing on ash. 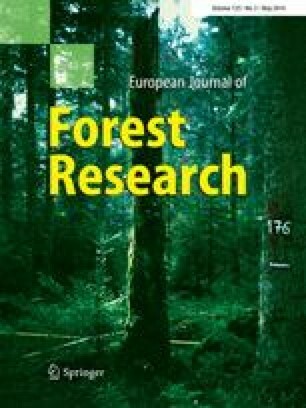 In Lithuania, during 2011, a forest regeneration inventory was performed on twenty clear-cuts, initially dominated by stands of ash, but severely damaged by the dieback caused by H. pseudoalbidus and clear-felled 1–10 years previously. In subsequent forest regeneration, grey alder and birch dominated. Ash regeneration was scarce, and its proportion decreased from 40–100 % in pre-dieback stands to 0–21 % in current stands. Of all observed ash trees (n = 775), 53.9 % were diseased, 16.8 % were dead, and only 29.3 % were visually healthy. Moreover, ash was among the slowest growing species, while grey alder, aspen and birch were the fastest. The regeneration and health condition of ash in forests, where previous to the dieback ash was dominant, demonstrated a sharp decrease in occurrence of this species and a clear shift in species composition towards grey alder and birch. This work was supported by the Nordic Forest Cooperation Committee (SNS) [project grant number SNS-109]. Authors are grateful to colleagues from the Lithuanian State Forest Service, staff of Biržai and Raseiniai State Forest Enterprises for their assistance in finding suitable research sites. Special thanks should also be addressed to Dr. Michelle Cleary for professional language corrections.